Web Hosting Services – Amsterdam, the Netherlands – LeaseWeb, one of the world’s largest hosting providers with a broad portfolio ranging from cloud computing to on-demand dedicated servers and managed hosting, has announced the launch of a CDN point of presence (PoP) in Singapore. The new PoP extends LeaseWeb’s global content delivery network (CDN) infrastructure into Asia, adding 100 Gbps to its current CDN capacity of 400 Gbps, while increasing distribution speeds in Asia Pacific. The SSD-powered infrastructure of LeaseWeb CDN, a solution aimed at high-bandwidth file and video distribution and live-streaming/broadcasting now consists of strategically placed PoPs in Europe, the U.S. and Asia. The CDN SuperPoPs, so named by LeaseWeb because of their extensive capacity, have a direct connection to one of the world’s largest IP networks, which has a total bandwidth capacity of 4.0 Tbps and utilizes smart routing as well as load-balancing methods. The addition of an Asia-based CDN SuperPoP to the existing SuperPoP locations in Amsterdam, Frankfurt, San Francisco, and Washington D.C. has increased the LeaseWeb CDN total bandwidth capacity to 500 Gbps. The LeaseWeb CDN utilizes leading-brand technologies and a unique open source-based architecture, designed end-to-end by LeaseWeb’s engineers. To establish the SuperPoP in the Singapore-based data center, LeaseWeb transported a variety of high-end equipment from Europe to Singapore, including multiple database, storage, and edge servers, as well as load balancers, routers, and switches. LeaseWeb engineers set up the SuperPoP-specific configuration locally and added the PoP to the global CDN infrastructure. The SSD-powered SuperPoPs and high bandwidth capacity of LeaseWeb’s global CDN infrastructure make the solution an exceptional fit for large file distribution on a global level—for applications such as software security and patch updates, video distribution, and live-streaming. LeaseWeb CDN supports HTTP live streaming (HLS) and pseudo streaming for video on demand (VoD). The codecs currently supported include HLS / HSS, MP4, H264, Flash Video (FLV), VP8 (WebM), VP9 (WebM), and Smooth Streaming. LeaseWeb’s CDN infrastructure is an open source-based solution, developed in-house by LeaseWeb’s engineers. It’s not only a high-speed, high-capacity CDN infrastructure. Other important features of the solution include real-time monitoring statistics to optimize content distribution; instant purging to ensure accurate data delivery; advanced origin protection to shield against DDoS attacks; and API-driven feature development to ensure enterprise integration. The CDN engineering team is continuously working on broadening its set of features with innovative new capabilities matching evolving client needs. 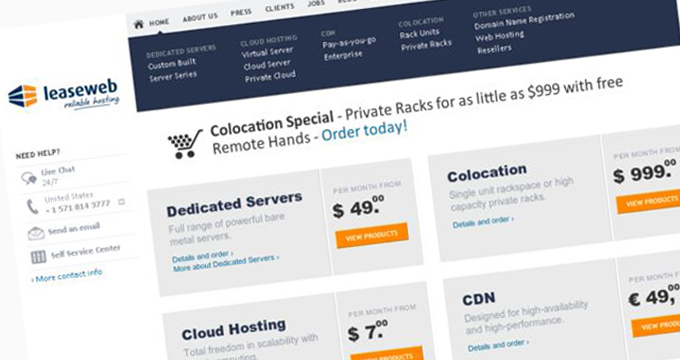 LeaseWeb CDN is available in two options, Enterprise and Pay-as-you-go, serving enterprise clients with tailored solutions as well as smaller customers looking for instant CDN functionality against minimal upfront costs. The Enterprise version offers high-volume CDN customers substantial cost savings over the Pay-as-you-go option. A 100% uptime service level agreement (SLA) is included with both options.